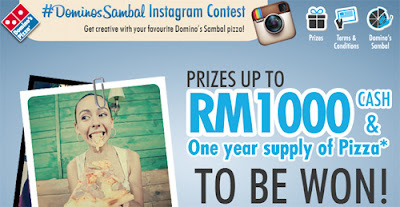 Take a picture of themselves with their favourite Domino’s sambal pizza along with a caption and upload it on Instagram with hashtag #DominosSambal. Voting will commence throughout submission period. Voting doesn’t determine the winners. Winners will be determined by judges. Submissions will be monitored and published at 12PM, 3PM and 6PM. Visit Domino's Facebook fan page for more details.